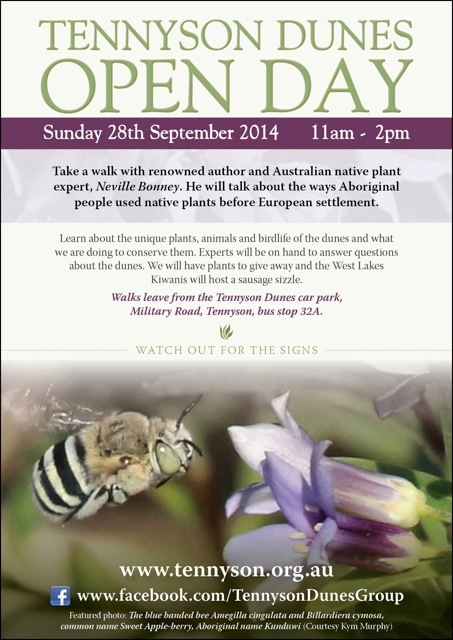 Neville Bonney, renowned botanist and author, will be guiding tours at the Tennyson Dunes Open Day on Sunday 28th September, 11am to 2pm. The Tennyson Dunes Group has invited Neville to show us just a little of how Aboriginal people used coastal plants prior to European arrival. Volunteers will also be on hand to explain how they’ve cared for the dunes over the past 19 years since the group formed. Last year the Open Day attracted more than 100 visitors and with the weather looking like a perfect Spring weekend you can expect it’ll be popular again this year. 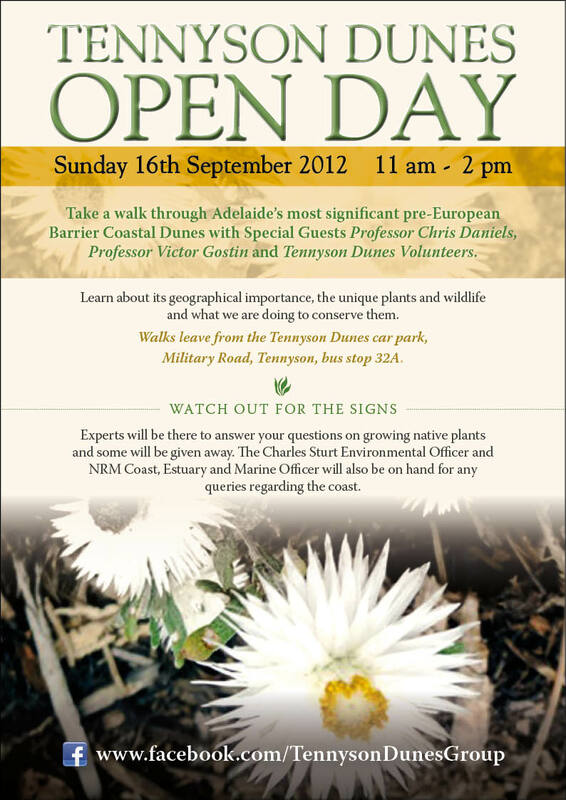 So, for an insight into a little known world make sure you get down to the Tennyson Dunes this weekend. We all know that wild, natural places are important for us to connect with nature. It’s where we do most of our environmental learning and it’s where we develop a love of the natural world. Too often, however, these places are at risk – like the Tennyson Dunes. Well now’s your chance to do something about it. The Tennyson Dunes Group are asking the South Australian Minister for Sustainability, Environment and Conservation, the Hon Ian Hunter MLC, to dedicate the Tennyson Dunes for conservation under the Crown Land Management Act 2009. This will provide them with some small protection against inappropriate development which threatens them and the wildlife that call them home. Support this proposal by signing the petition here. Experiential learning is what it’s all about. The best way to learn about nature, the best way to develop an appreciation for nature, is to be amongst nature. Get the sand between your toes, so to speak. 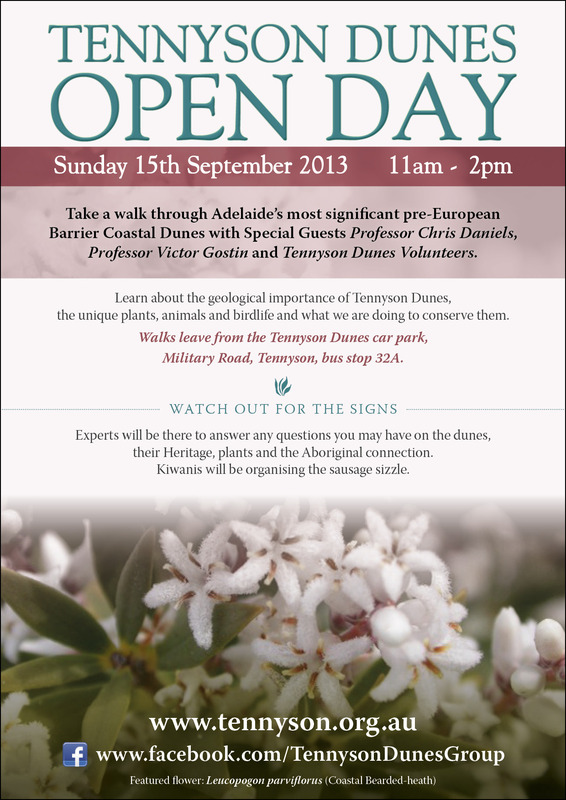 To this end, the Tennyson Dunes Group is holding their annual open day this coming Sunday – 15th September 2013 – from 11am to 2pm. Guided walks, led by the volunteers themselves, leave every half hour and you’ll get a chance to hear from special guests Professor Chris Daniels and Associate Professor Victor Gostin. So if you want to hear about the natural history of Adelaide’s coastline, see what the volunteers do to protect the dunes, check out the wildflowers and native fauna or just want to get sand between your toes be sure to get down to the Tennyson Dunes tomorrow. The Tennyson Dunes Group is holding their spring open day, giving tours of the wonderful Tennyson Dunes, on Sunday 16 September 2012. It’s guaranteed to be a great day out. This is community environmental education at it’s finest. Professor Chris Daniels and Associate Professor Victor Gostin will both be there to give guided tours, each highlighting the dunes in their own special way. The Tennyson Dunes are the most significant coastal dunes on the Adelaide Plains. They are the largest of only three pre-European remnants and the only ones to still have the original tertiary dune system. Threatened species of plants and animals abound and they are the only place you can see what Adelaide’s coastal dunes might have looked like in Colonel Light’s day. Come along and see why the Tennyson Dunes Group is the winner of the 2011 Premier’s NRM Community Engagement Award. Not only will you experience a great tour, but you’ll be able to see the environmental education initiatives of the group (including excellent interpretive signs created by the Marine Discovery Centre), support local volunteers, and most importantly, learn about Adelaide’s fantastic coastal ecology.